October 2008: First-Ever Progeria Clinical Drug Trial Surpasses Half-Way Mark! PRF continues to make history, as nearly all the children enrolled in the trial have come to Children’s Hospital Boston for their 1-year visit, marking their half-way point to completion. Click here for details on how you can help. Exciting times! The Progeria clinical drug trial began on May 7th, 2007 with two children arriving in Boston, MA for their first of seven visits over a 2-year period. At this first visit, they were given extensive tests and their first doses of the drug. An average of two families have been flying to Boston each week since then, and in October 2007, the trial became fully enrolled. The trial is expected to end in October 2009, with results published in 2010. As of October 1, 2008, all but one child has completed the week-long, 1-year visit. Francis Collins, MD, PhD, Director of the National Human Genome Research Institute that mapped the human genome, workshop speaker and co-discoverer of the Progeria gene. Twenty-eight (28) children from sixteen countries are participating, ages 3 to 15 years. Children return to Children’s Hospital Boston every four months, for testing and to receive new drug supply, and stay in Boston for 4-8 days each visit. While at home, their doctors keep a close watch over the children and submit monthly health reports to the Boston research team. For the duration of the trial, 1- 2 children per week will travel to Boston to participate. Michiel, 8 ½ , from Belgium with Hayley, 9 ½ , from England in June at Children’s Hospital Boston during their first visit. The clinical trial is led by Mark Kieran MD, PhD, Director, Pediatric Medical Neuro-Oncology, Dana-Farber Cancer Institute and Children’s Hospital Boston; Assistant Professor, Departments of Pediatrics and Hematology/Oncology, Harvard Medical School. Dr. Kieran is a pediatric oncologist with extensive experience with the drug under study (farnesyltransferase, or FTI) in children. The clinical trial is a collaborative effort. The children are being seen by physicians at Children’s Hospital Boston, Dana-Farber Cancer Institute, and Brigham and Women’s Hospital, all Harvard University institutions. In addition, physicians and scientists from The Warren Alpert Medical School at Brown University, UCLA, and NIH are helping to make this trial a success. Many individuals are working together to perform this research. How did we get to this point? In 2002, The Progeria Research Foundation’s collaborative research team discovered the Progeria gene. This discovery not only led to further understanding of Progeria, but scientists now know that studying Progeria can help us learn more about heart disease and the normal aging process that affects us all. Since the gene discovery, the support of researchers, clinicians, families of children with Progeria have brought us to another crossroads in the search for a treatment. Researchers have identified a potential drug treatment for children with Progeria, called farnesyltransferase inhibitors (FTIs), and have conducted studies in the lab that support a human trial with the drug. Click here for more details on the research. How will this drug work in Progeria? The protein that we believe is responsible for Progeria is called progerin. In order to block normal cell function and cause Progeria, a molecule called a “farnesyl group” must be attached to the progerin protein. FTIs act by blocking (inhibiting) the attachment of the farnesyl group onto progerin. So if the FTI drug can block this farnesyl group attachment in children with Progeria, then progerin may be “paralyzed” and Progeria improved. Click here for more information on FTIs. What will the trial cost PRF? We estimate the trial will cost PRF $2 million dollars. This will pay for clinical testing, translators, flights, food, lodging, and certain medical costs during that 2 ½ year time period. Your donation will help make this trial happen. 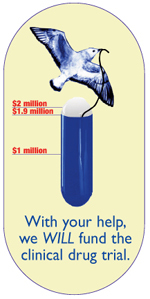 PRF needs to raise approximately $2 million dollars to fund this trial, and as of July 2009, we have raised $1.9 million! In 2006, the Circle of Hope campaign was created to raise $100,000 per year for 5 years to keep our Cell Bank, Diagnostics Testing, research grant funding and other programs running full speed ahead. Meeting this fundraising goal would allow us to keep up with the increasing interest in Progeria research, and to continue our pace of progress. Who could have imagined that less than a year later, we would be in the midst of a campaign to raise $2 million to fund a drug trial to treat Progeria?! Our Circle of Hope campaign now includes this g undertaking. Please help us keep the Circle intact, so the hope of treatment becomes a reality. Donate today. This is the time to find a treatment for Progeria.